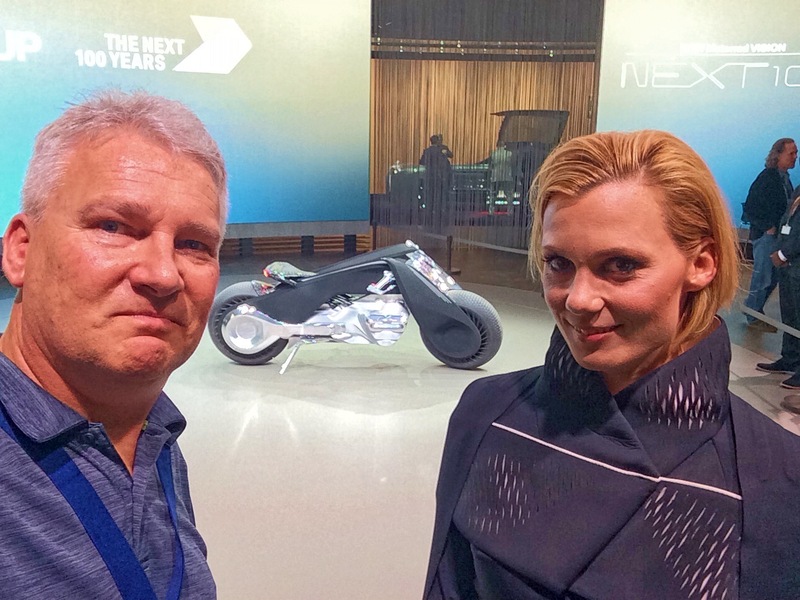 Who is that woman on the BMW future bike? The striking model who rode the BMW Vision Next 100 motorcycle onto the stage here in Los Angeles caused almost as much interest as the bike. Never a publication to shy away from the hard questions, Editor Richardson collared her to find out if she’s a motorcyclist or just a pretty face. In fact, Michaela is the real deal. She’s a marketing and communications manager for a Swiss medical rehabilitation agency, and she rides to work from her home across the border in Austria on one of her two motorcycles: a 1986 BMW K100, or a 1976 Harley Low Rider shovelhead. Both are customized just as she likes them. Apparently, a friend at a German magazine heard that BMW was looking for a suitable person to be the rider of the Vision Next 100 and introduced her in June to the right people. It’s just gone from there. She’s not sure about future appearances though – “I’m pretty busy at my full-time job,” she says. Gosh, what a debonair and charming man, she’s undoubtedly thinking. And how’s the bike to ride? “It’s pretty easy, it balances itself,” she says. It’s just a conceptualization of a bunch of ideas right now, so there’s a small electric motor in there somewhere that makes the bike move, but there’s also a gyroscope to keep it upright until it’s switched off, similar to a Segway. The canvas seat roll is nearly as old as road cycling itself, but the Premio ($49) adds a twist by utilizing a hot-melt wax treatment for waterproofing then adds reflective thread to increase visibility. Nice post for who guys are searching everything Top 10 in the World. Definitely more interesting than the whatever it was she was sitting on. She is a vision of my imagination and her name is Eternity 🙂 ?? “Editor Richardson collared her to find out if she’s a motorcyclist or just a pretty face.” Really, what are you trying to depict here, that any female is meant to be roped up and put through the inquisition for any sense of “validity” and is free to be released on your command, once you approve or disprove? I think she just set a land speed record on the salt flats ?? ?